Review of Achor Old Foghorn | Beer Apprentice - Craft Beer News, Reviews, Interviews and Info. For today’s drinking pleasure, I’m going to be having an Anchor Old Foghorn Barleywine Style Ale produced by the Anchor Brewing Company located in San Francisco, California. Anchor has always been one of my favorite brewers and they make some very solid beers, so I’m sure my first experience with Old Foghorn will be a good one. Here’s the description from the website, anchorbrewing.com. 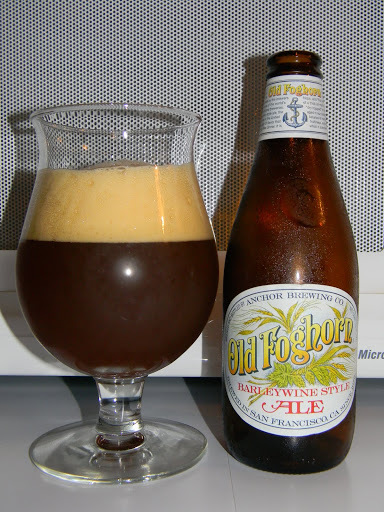 Old Foghorn Barleywine Style ale is brewed strictly according to traditional brewing methods, using only natural ingredients – water, malted barley, fresh whole hops, and yeast. Old Foghorn is based on traditional English barley wines. Old Foghorn is highly hoped, using only Cascade hops. It is fermented with a true top-fermenting ale yeast. Carbonation is produced by an entirely natural process called “bunging,” which produces champagne-like bubbles. Our “barleywine ale” is dry-hopped with additional Cascade hops while it ages in our cellars. We have been producing small batches of Old Foghorn since 1975. Today, it is available both on draught and in twelve-ounce bottles. The high original gravity and full flavor of this ale make it a unique product, perfect for sipping after dinner. A lot of time and tradition goes into our Old Foghorn, and we hope you will enjoy it as much as we do. Whew!!! That’s quite a description. This beer has an ABV of 8.2% and comes in a 12 oz. bottle. The appearance of the Old Foghorn is a deep brown, rust to copper color with a few red highlights showing through around the edges. The body seemed to be mostly clear. The head was a tan color, creamy, smooth and luscious. It retained a very nice size for several minutes and as it retracted it left some very nice lacing behind. The fragrance was comprised of some super sweet caramel and toffee malts. A burnt, candied sugar commingled with a prevalent molasses hint added further sweetness. Some dark fruits of raisin and plum combined with some light alcohol notes created a very unified flavor appropriate for the style. I did notice that the aroma seemed a touch more aggressive regarding the “hoppy” grapefruit notes. It wasn’t overpowering, but rather just a touch more than what I’m used to in a Barleywine. Overall though, I thought the smell was great, well balanced and pleasant. In the taste, I immediately got more of the sweet, sugary caramel, soft toffee and rich molasses. Some baked bread and biscuits were incorporated in the taste to help create a “smoother” profile. The dark fruits were noticed again and welcomed, but they didn’t seem to be as robust as they were in the aroma. I did receive a decent little hop bite though. Medium strength alcohol tones finished off the savor nicely. The mouthfeel was a solid and sturdy medium. It was sticky, but smooth and somewhat chewy. It was dry, had plenty of warmth and left a touch of burn in the finish. Plenty of flavor was left behind. Not too much, but enough to hold me over until the next sip. Anchor Old Foghorn is a very good brew in my opinion. It’s not quite as gargantuan or prodigious as some other Barleywines, but it was still well made with plenty of the proper characteristics. I found myself enjoying this more and more with each sip. It was highly drinkable considering the 8.2% ABV also. As it warmed it became more refined and balanced in the aroma, taste and mouthfeel. I will not hesitate to pick this up again in the future. I would recommend that you do the same if you have not tried it. Who makes your favorite Barleywine? Please leave a comment and tell me all about it if you like. As always, thanks for reading!!! !